On a broiling Tuesday in El Paso, America’s quintessential border town, President Obama spoke for half an hour about that thorniest and stubbornest of social issues: illegal immigration. A vocal crowd of Obamaphiles braved the West Texas heat and sunshine to see the president, who defended his administration’s border record, knocked the opposition and outlined a semi-tough but fundamentally generous-spirited immigration policy. I wouldn’t expect Obama to endorse the idea of rounding up America’s 11-20 million illegal immigrants for immediate deportation, and of course he didn’t. (It’s worth noting, though, that the Obama administration sent nearly 400,000 illegals back to their homelands during the 2010 fiscal year.) Still, Obama was adamant about recognizing illegal immigration as illegal, something his friends on the left refuse to contemplate. It is, after all, a sign of progressive street cred to avoid the dreaded “I” word, and Obama didn’t avoid it. “The presence of so many illegal immigrants makes a mockery of all those who are trying to immigrate legally,” he said, to his credit. If Obama had his way, he’d send our illegal immigrants to the back of the waiting line. Those who expect to continue living here would have to register, learn English and pay taxes (assuming they earn enough to pay taxes). Then, and only then, would we consider them for citizenship. We’d also crack down on businesses that hire illegals, eliminating the vast underground economy that offers bare subsistence to undocumented workers and depresses wages for everyone else. Fair enough, right? Almost seems like the ideal moderate solution, doesn’t it? I’m not so sure. Under Obama’s policy, we’d essentially be stuck with all the millions of illegal immigrants who aren’t nefarious criminals. We’d accept them, willingly or begrudgingly, into our family and hope they feel inclined to assimilate. Here’s my concern. Will a growing immigrant population in the tens of millions, all originating from the same culture and fluent in the same language (which we’ve foolishly enshrined alongside English as our unofficial second tongue) willingly become full-fledged Norteamericanos? Will they celebrate the Fourth of July, make pilgrimages to Independence Hall and honor the memory of George Washington? Or, given their abundant rates of immigration and reproduction, will they simply be pushing the northern boundary of Latin America up toward Maine and the Great Lakes? Will our country be speaking Spanish before the current century is out? Will tacos finally replace burgers as our artery-clogging fast food of choice? I have to confess that the great Latino incursion brings out my inner reactionary, as it does for many less moderate souls. Why? Because I hate to see cheating rewarded. Because the new immigrants so often avoid income taxes but readily demand our social services. Because that demand is stretching our treasuries to the breaking point. Because, at bottom, I don’t want America to change beyond recognition. I don’t want us to become another Latin American republic. We already have plenty of those in the Western Hemisphere. It’s not that I’m against change per se, just sweeping and irreversible change. I’m a moderate, after all. Any prospect of a radical ethnolinguistic transformation of the U.S. unsettles me and makes me melancholy; it wouldn’t matter if the new horde spoke Spanish or Ukrainian. I feel almost like a Wampanoag chieftain watching wave after wave of English settlers arrive on the shores of my land. But what about America’s rich history of immigration, you ask. It was immigrants who made America the bustling epicenter of progress that we behold today. True enough… but those immigrants came to us from dozens of nations, spoke dozens of languages and aspired to participate fully in the great American experiment. They made America sing with optimism and vitality. So one way to strengthen the middle class in America is to reform the immigration system so that there is no longer a massive underground economy that exploits a cheap source of labor while depressing wages for everybody else. I want incomes for middle-class families to rise again. I want prosperity in this country to be widely shared. I want everybody to be able to reach that American dream. And that’s why immigration reform is an economic imperative. And reform will also help to make America more competitive in the global economy. Today, we provide students from around the world with visas to get engineering and computer science degrees at our top universities. Look at Intel, look at Google, look at Yahoo, look at eBay. All those great American companies, all the jobs they’ve created, everything that has helped us take leadership in the high-tech industry, every one of those was founded by, guess who, an immigrant. What the president neglected to mention was that those earth-shakers were legal immigrants. He also assumed an equivalence among Asian, European and Latino immigrants, which is the appropriate liberal attitude to assume. But any cold-blooded neutral observer would note, not so liberally, that Asia and Europe typically send us their best and brightest while Latin America has been sending us its most desperate. It’s a hard and even cruel distinction to make… after all, we don’t want to submit immigrants to the equivalent of college boards before we grant them entry. But we have to recognize that America is already in a state of decline. Our middle class is dwindling, thanks in part to the financial meltdown of 2008 and the chronic outsourcing of jobs by American corporations. At the same time, our underclass is growing by leaps and bounds. Eventually we’ll reach the tipping point: the middle class will no longer be able to support the underclass, and all of us will be sliding down the long chute to oblivion. As our federal deficit soars to truly hair-raising levels, we probably need to start recognizing the difference between immigrants who would contribute to our society and immigrants who would burden it. It’s a tough and almost un-American stance to take, but we need to take it for our own survival. It’s not a simple question of ethnicity, either; many Latino immigrants can and do make valuable contributions once they enter the U.S. The most significant step we can now take to secure the borders is to fix the system as a whole so that fewer people have the incentive to enter illegally in search of work in the first place. Well said, Mr. President. Now let’s do it. There is a solution to the illegal immigration problem. Secure the borders – and by that, I mean REALLY secure the borders, which we are absolutely capable of doing. Then, and ONLY after border security issue is being actively enforced, create processes to legally integrate the illegal immigrants that have been living and working here, and who want to become law-abiding American citizens. I firmly believe that an amnesty program under those circumstances would have broad public support. Americans, both liberal and conservative, are a generous-spirited people. But Obama will never support border security, because the Democrat Party is bound and determined to “fundamentally change America” by creating a huge voting block of impoverished immigrants, beholden to the welfare state. He gives lip service to the middle class, but, as you rightly point out, the middle class is rapidly declining, attacked from both above and below. You see Obama’s position as idealistic, I see it as coldly cynical…his idea of “immigration reform” is blanket amnesty, as laid out in the DREAM Act, without any border security at all. You need only look at Arizona’s struggle to secure its border to know that the Obama administration will demagogue this to the hilt…and frankly, there are Republicans that hope to capitalize on amnesty as well. If we prioritized the rule of law over the political and economic welfare of our ruling class, and elected representatives who would support the law….well, maybe there would be a chance to turn things around. I’m not optimistic, but I haven’t given up hope. Priscilla: I’m shocked (shocked, I tell you) that you’d advocate amnesty for the illegals who are already here. But you might be right. I’m probably not as generous-spirited as you are on this issue, especially when I think about the fundamental changes these immigrants are bringing to this country as they settle here. (Minimal skills, high birth rate, high dependence on public services, reluctance to learn English and identify as Americans. Of course, that’s not true across the board, but it’s true enough to unsettle me.) I’d send them to the back of the waiting line, which is what Obama proposed in his speech. I suspect that Obama, in his heart of hearts, looks forward to a less white, more Democratic (capital D) U.S. But he can’t keep paying lip service to controlling the border without eventually backing up his words with action. How cynical is he? (I prefer to use the word “calculating,” since I regard cynicism as a kind of virtuous disgruntlement.) Like any politician, he wants to maintain a broad base of voter appeal… can’t blame him for that. But I like his willingness to depart from the progressive pieties. At least he’s adamant about labeling illegals as illegals, something a lot of lefties refuse to do. When the economy was “booming” and jobs were affluent was anyone really complaining as loud as they are now about the people working in landscaping, hotels, picking vegetables, etc.? No, because they were helping in a time where things were on the up and up. Now that everything has soured…to use the illegals as scapegoats for the current crises and to attack them first isn’t the answer. The problem with illegals is how we let them come in and let them work without letting them “participate” in the “great experimentation”. “Participate” meaning that they pay their fair share of taxation to live here and be free from Mexico’s problems of drugs, crime, and poor economy and laws. The desire to come to the U.S. will fluctuate based on how the rest of the world is operating. To say others don’t deserve a good life is wrong, but the question is “how to go about it” in order to give it to those that want a better life for themselves. Those in the country today are still probably working. Those illegals that aren’t probably will go back to Mexico. Identifying these people and having them pay into the system would help the U.S. Economy…As long as the politicians do their part with the money collected “wisely”. I am still waiting on this one. We need fixes to Social Security and Medicare. Raise taxes, cut benefits or another way. A high birth rate now would mean plenty of young people 20 years from now paying into Social Security without many of us paying double into Social Security because we let the Politicians spend the account and gave us IOU’s. Getting some taxes from the illegals here wouldn’t be bad and we would still let them work where they are now. Get them to the back of the line while they work. We have only ourselves and the politicians to blame for letting them get into our country, but we can stop them from crossing the border via enforcing the law and increasing the number of guest visas and legal immigration numbers allowed per year and it should be tied in a percentile to how the U.S. economy is growing or shrinking. We are moving close to the tipping point at which more than 50% of Americans will pay no federal income taxes whatsoever (I think it’s something like 47% now)…..and that is without the DREAM (aka blanket amnesty) Act, which admittedly has about zero chance of passing before 2012. It seems to me that once we have more people voting themselves money, in the form of state welfare, jobs, etc., than we have people paying taxes to keep that state going, we’re going to see a middle class revolt, the likes of which will make the Tea Party look pretty mild. Unless , of course, the middle class goes meekly to its doom…. but I don’t see that happening. And that is where the Democrats are leading us, I’m afraid, all the while using sob stories about people in the “shadows” and bogus charges of racism against anyone who happens to mention – gasp! – the law. Not good. It seems impossible for us to agree on anything – though atleast on this issues you have flipped to the right of me – the far right. The issues with respect to immigration are ludicrous. First even studies done by raging right wing loons found that there is no difference in the rates of assimilation between Hispanics and prior immigrant groups, They have approximately the same rates of criminality, the learn English at the same rates, the climb the class pyramid at approximately the same rates. Trying to pretend that the hordes coming from the south are somehow different from the waves of Irish, Italians, Chinese…. from our past. The wage depression issue is raised all the time in all kinds of contexts, not just immigration, and it is as fallacious here as anyway else. Business adapts to the Labor market. If there is a mass of readily available cheap labor, business finds a way to use it. If the existing labor is not cheap enough to make a product profitably, business moves where the labor is cheaper or automates the production process so as to not need expensive labor. This is not evil, it is just how it is. Attempts to alter it by law are essentially price controls – and price controls have failed always and everywhere. The united states could annex Mexico, and while lots of jobs would move south, there would still be a net gain of better jobs within the fifty states. Virtually every rational economic theory – including Keynes, identifies “sticky wages” – the resistance of wages to the downward pressures all other commodities experience. Securing our Borders is simple. Make it trivial for people to enter the country easily, and then the few crossing the borders illegally will be real criminals, not people seeking a better life for themselves or their families. The “illegality” argument is equally ludicrous. How aside from accident of place of birth do you or I rate the status of legal american’s ? There are no fundimental differences between Mexican border crossers and you and I except the color of our skin and the place of our birth. In comparision to many other citizens they atleast are willing to work their asses off to make a better life for themselves and their children – something far to many legal americans are unwilling to do. Why don’t we trade ? Todays immigrants are indistinguishable from our grandparents. They are coming from far away to a strange land where they do not speak the language, where many of us hate them to work for low wages at crappy jobs. Our decision to declare immigration legal at one time and illegal at another does not change who they are or make them somehow different from our parents. They come to chase the american dream – exactly like generations of past immigrants. The country has not been overrun by the irish, the italians, the poles, the chinese, the …. Our culture has been enhanced not destroyed. They (and our parents who preceded them) are the american dream. 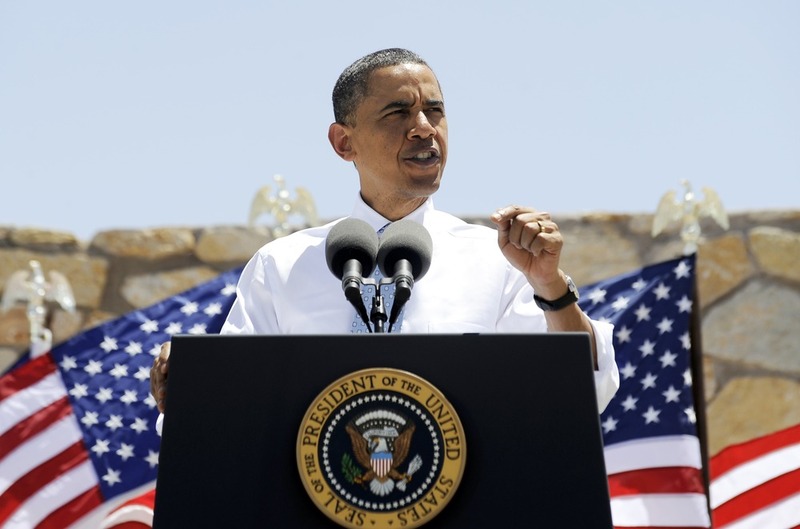 This president has a problem with the concept of american exceptionalism. This country is exceptional – not because we were chosen by god – we were not, not because of abundant resources – africa has more. There is nothing exceptional about the place. What makes this country exceptional is the people. From the first colonies, we all came from somewhere else to make a better life. This country is self selecting for ambition, entrepeurship, risk taking, hard work, …. our education system is failing – yet we are still far more creative than our numbers. We are 1/25 of the world’s people, yet we are 1/3 of the world economy. We are afraid of China – yet California has nearly as large an economy and Texas is right behind. If the economy of each state was treated as a country, US states would make up 50 of the top 78 world economies – two thirds. There is alot wrong with us, but we still get things done. I am under no delusion that all those who come here are noble, upright worthy future citizens – but there are alot of crooks in our own past. Another great fault in modern political discourse – more common, but not unique to the left, is confusing the obvious visible effects of something for its entirety. We see the good things government spending brings – we fail to see the cost. We see the problems with immigration, we fail to see the benefits, we see the harm of free trade we fail to see the benefits, we see the benefits of the entitlements state, we fail to see the costs. In these and many many other instances what we see is inconsequential in comparision to what we fail to see. How exactly is it that a mass influx of cheap Mexican labor is going to ruin our society ? Are their millions of citizens actually seeking the crappy jobs they are purportedly trying to take from us ? For the most part they are taking jobs that would not exist but for them. If we were really going to send all the illegals home, and put everyone collecting unemployment or welfare to work as unskilled farm, or construction labor, or processing chicken nuggets, then maybe there would be a case. It is not immigrants that are our biggest problem, it is the entitlement state. Open Immigration is incompatible with government guarantees. The former makes us stronger – our own history proves it. Almost all of us came here as outcasts from elsewhere – seeking freedom and opportunity – and we built the greatest nation on earth. We are the children of the homeless wretched refuse from the rest of the world, how is it that we can say no to the modern heirs to our parents plight ? dhl, You speak more like a Centrist than a Moderate going Left/right. I like the way you put in much thought. In other words, the statements and then the opposing view. You would get a “Centrist Ideology Award” for placing thinking above emotion….if I had an Award. You could possibly be a candidate to be a Centrist Party membership and a part on a Board of Immigration for the NCP (National Centrist Party). You would have others to bounce around logic questions and answers using facts and of course the meeting should always be keeping down the “emo”. That is if I had some people for an NCP. Kent: NCP — I like the sound of it. Of course, it’s an uphill struggle to get centrists to agree about anything — including the formation of a party for centrists. We’re so fragmented at this point. But if you want to organize it, you have my blessing! dhl: Of course the immigrants crossing our border from Mexico are different from the 19th and early 20th century immigrants: they all speak SPANISH. They constitute a single ethno-linguistic bloc — a transplanted nation — as opposed to the patchwork of Irish, Scots, Germans, Italians, Jews, Poles, Russians, Scandinavians, Hungarians, Greeks, Armenians, Lebanese and Chinese who came here in the past. What’s more, they’ve entered the country by breaking its immigration laws – nice start! If we accept the illegals as bona fide Americans, what do we say to the countless foreigners who have been waiting years to enter the U.S. legally? As for wages… if the immigrants are here illegally, they artificially depress wages because they’re desperate to earn income without getting caught. Employers can therefore pay them coolie wages with impunity. This isn’t free-market capitalism; it’s exploitation. I hate to dampen your idealism, but I’m really not too optimistic about the future of this country, with or without its illegal immigrants. My ancestor came to the country in 1749. Roman Catholic. Their was only 4 Roman Catholic churches in the colonies at the time. The Anglican Church controlled everything. My ancestor was an “indentured servant” to the captain for his passage to the British Colonies. I don’t see a problem with the first immigrants working hard for freedom. First immigrants are the strongest, hardest working class of people in this country as a group. We can’t have illegals all crossing the border freely, but we can tie legal immigration numbers via work visas, guest visas, legal immigration to the U.S. Economy growth cycle and right now is not a good time to allow large numbers into the U.S. We need to enforce the laws. Low wages for Serfs are good for the produce. Instead of paying $2 per lettuce head it would be $5 if they become Union and get high wages. If it was legal Americans working in the lettuce patch you would be paying $5 anyway. I don’t see it as exploitation if they say “no” to working. You can always walk off the job and go somewhere else. It is only exploitation if you are a slave. To say that the illegals don’t talk about the better wages in other places of the country would be silly. It’s simple ecnicmoos: Supply and Demand. If the gardener could get more money for his services, he would leave and find a better paying job. There isn’t a better job for him so he has to take what he can get. It’s somewhat comparable to accepting and denying job offers.Trust me, just let your dad do what he has to do. Don’t pay outta your picket but if you want to, be kind to the gardener. Offer a snack or a drink throughout the day. A smile goes a long way and you don’t have to speak the same language to appreciate generosity. Sorry for doubling up here, but I just can not let the assertion that securing our borders is easy stand. There is no doubt if we are willing to spend enough money – and it will not be a small amount that we can do better. But successfully impeding people desiring to go somewhere else is really hard. People arrive at US ports in cargo containers, They have fallen out of aircraft, come accross in innner tubes, dug tunnels, …. East Germany needed a fortified wall, with closely spaced machine gun emplacements – and that just slowed things down. Are we ready to kill anyone trying to enter this country through the back door ? China can not keep out North Koreans. The RIAA will tell you how bad an idea it is to get into a technological war with a numerous and motivated opponent. Maybe we should make getting in more difficult – but only as a Darwinian test – if you can surmount our barriers you have what it takes to be an American. Ultimately one of the biggest obstacles, is the institution undertaking the task. These are the people who brought us Cabrini Green as the solution to poor housing, Fannie Mae and Freddie Mac for Mortgages, Corn Ethanol. These are the people who think the Frost-less refrigerator saves energy and resulted from government regulation. These are the people who when they fail at something get even more money to do the job even worse. This is government. Part of what separates libertarians – for republicans and democrats, is grasping that government always does things worse. That is not a flaw, but a fact. Though we get too much of both, inefficient government is tolerable, it is the price we pay for less corrupt government. In the free market, it is inefficiency that is intolerable., corruption is self correcting. To the extent that one accepts that securing the borders is even necessary, it would be the responsibility of government. But there is 2000 miles of border between the US and Mexico alone – the vast majority of which has little in the way of serious barrier at all. The cost of a border fence was $2.5B until it wast $6.5B and many estimate it will likely be $50B and that is for only 700 miles worth. Nor does that include patrolling it. It is even possible that if we spend $50B we will get something intimidating and technologically impressive. It is virtually certain that it will have been circumvented before it is completed. There is really only one effective way to keep immigrants out – make the country less attractive. The recent economic decline has slowed if not reversed the flow of Mexican immigrants. If you are not blind there is a point in there. Jobs and economics are not zero sum. It is not a coincidence that when there are more “illegal aliens” there is less unemployment and more jobs, and conversely that when there are less there is more unemployment and less jobs. The meme that cheap immigrant labor takes away higher paying jobs is false. Given the opportunity the economy will grow to accommodate almost all available labor. Increased immigration corresponds with decreased unemployment – and visa versa. Additionally, I think that a large piece of Rick’s argument has to do with the issue of assimilation, and here I think that we place our democratic republic in real danger by allowing participation from those who have everything to gain from that entitlement state, but little inclination or motivation to contribute. Putting it more simply, our entire society rests on the assumption that we are self-governed. How do you continue to be self-governed when the “self” that governs is different than the “self” that is governed……if government becomes simply a vehicle for redistributing income from those who earn it to those who need it, the whole concept behind American democracy and a free economy is lost. Huh? This is one of those statements that works great in an insulated higher-education environment where scratching of one’s chin is a goal. Unfortunately, this is not realistic. There are fundamental differences between many peoples, and Mexican/US differences are substantial. Most of our immigrants came for the same reasons the Mexicans did, except they wanted to be Americans. Many Mexicans believe part of the US is actually Mexico, and therefor it is theirs to be in. That’s a HUGE difference… i.e. fundamental. Mexico was originally populated by Native American Aztecs and Mayans who were conquered and converted to Christianity by the Spaniards. In 1821, after deciding that the Spaniards sucked, Mexico revolted and gained independence. Now, that they have independence, why not conquer new territories? Isn’t the US doing the same thing after the Independence Day? BMR: Yes, some Mexicans (and U.S. leftists) think of the Latino incursion as a “reconquista” — a justifiable reoccupation of former Mexican territory. The problem is that their settlements aren’t restricted to the Southwest; they’re colonizing cities, towns and farming hamlets from Maine to the Pacific Northwest. Anonymous: Valdo, was that you? I wish the Mexicans would turn their sights to the southeast instead. They could create a unified Central American republic stretching from the Rio Grande to the Panama Canal. But maybe we shouldn’t give them any ideas. Why go Southeast when they did a lot of work in North especially California? I like your views and you touched the “surface”. There is so much to discuss on this. DHL and Priscilla for the most part discussed it even deeper giving pros and cons which would get dhl an award. My part in this is Obama and the left/right political machines. As a Radical Centrist I don’t like being played a fool. The speech Obama had made based on what you posted was spun so well that you have to know the background to understand the con job he’s pulling. For Example: Obama taking away the incentive to come to America isn’t the problem because that is what made the U.S. a great nation. Of course, it is his plan because if you take away the incentive for all then no one even smart ones would want to come to America. The border fence/control and the incentive to come to America are separate items. If you secure the borders and leave the “incentive” alone (great opportunity) then people will still come to America and come “legally”. My deal is that Obama thinks that raising farm laborers wages will not raise produce costs. When you raise wages costs go up unless you can find a cheaper source. Obama lacks economics and is all Ideology. It’s all about enforcing the law!! law enforcement catching 4,000 – 8,000 daily isn’t going to do it unless you get serious. Fixing Mexico is the problem. Canada isn’t…the economics!!!! Crossing into Mexico illegally is 60 days in jail. A second time is 2 years. Obama speaks about what is “Fair” all the time. Hello! POTUS. Practice what you preach! Do something than nothing with the borders that give illegals second-thoughts. They take us “middle thinkers” as idiots. I mentioned about six months ago in a comment that Obama was moving to the “middle” in order to garner the “middle” votes. I am glad you see this. Kent: You’re right about the downside of making the U.S. less desirable as a destination. But stricter border controls won’t entirely stop the Mexicans and other Latinos who are desperate to settle here. The U.S. is where the money is (at least for now)… and the illegals have a powerful will to arrive here by any means possible. Fighting them is like trying to stop the flow of lava. Should we stop trying to arrest them? No, of course not. But I don’t see how we can effectively defend a border that’s 1500 miles long (or however long it is). I think the Arizonans, for all the grief they’ve taken, probably have the right idea: make it as unpleasant as possible to be an illegal immigrant in the U.S. Interesting comments on Obama, too. I think he’s making a genuine attempt to govern from the center, but not entirely for idealistic reasons. Yes, you could almost hear the spinning during his El Paso speech. He’s obviously sympathetic to the immigrant cause, but he’s responsible enough (and concerned enough about Middle American votes) to at least pay lip service to tightening border controls and imposing conditions on illegals who are already here. One thing no one seems to write about is how to make Mexico better for its own people so they can make a decent living without even thinking of going to the USA. Valdo: Yes, immigration is justified: legal immigration, with quotas. We can’t invite the entire population of the Third World to settle here, or we’d become a Third World nation ourselves. (We’re gradually moving in that direction, anyway.) A century from now, “developed” nations like India, China and Japan will probably be sending medical aid and building schools for our poor people. Yes, the US have big chances to become a third world country, a poor country but with a strong and rich dictator that will control other world dictators. That’s because this is the kind of mentality the US is exporting. The US corporations are not dealing with a said population of a country but with their leaders. When the US is removing a dictator, it is not because corporations have pity for suppressed population under a dictator that deals with the US, but because the dictator doesn’t keep business with the US corporations at the US advantage. In the communist times economies of capitalist countries had flourished because capitalist countries could get cheap resources and labor from communist countries. Romania was one of the big exporters to the US as it was and is China. Communist Romania and China had “the most favored nations” in trading. Romanian population was suffering, but the US corporations were trading with our Communist dictator – Ceausescu. Romanians did not get their fair pay from this trading, so they emigrated to get their share from capitalist countries. The same thing is happening now with Arab countries and Latin America, Mexico included, which are in trading with the US corporations. Poor people are emigrating in capitalist countries to get their share from the deals made between capitalist corporations and dictatorial rich leaders of poor third world countries. It is not the fault of American citizens that their corporations have a primitive and savage kind of trading resulting in increase of illegal aliens. What remains now for the US corporations is to isolate their gains, refuse to pay taxes, and get a stronger police. Exactly the third world model of “civilization”. Also badmouth the Europeans for being socialists. I know that my phrasing is poor, but try to get my point I am trying to convey. valdo, you have hit on something important and disturbing, which is the decline of free market capitalism in the US, rapidly being replaced by a government controlled style of capitalism, under which corporations do the bidding of political leaders or face punitive control and regulation, similar to that seen in dictatorial economies. I’m not sure why you think that trying to make a profit – which, after all, is the rightful purpose of a corporation, is primitive and savage. Perhaps you mean that many corporations, forced to seek cheaper labor costs in the pursuit of profit, have found that manufacturing products in “primitive and savage” economies, such as the Far East and Latin America means that they can produce those products at a price that people can actually afford? Unfortunately, many have found that that is not possible stateside. Just look at Boeing, which just last month was told by the government that it CANNOT relocate the manufacture of one of its planes to South Carolina, because SC is a right to work state. The government, in the form of the National Labor Relations Board, says that Boeing must keep all of its production in Washington state, where the union controls the jobs. Keep in mind, that Boeing is not proposing laying off any union workers in Washington – it just does not want to open up a new production line in a state where labor costs are astronomical. The 1000 jobs that the corporation would create in SC would be good, high-paying jobs…….but the union doesn’t want the jobs to be free market based, so they have successfully gotten the NLRB to tell a private corporation where it can and cannot do business in the US. Hey, I would be pretty pissed if I were an unemployed South Carolinian, native-born or immigrant, hoping to see good jobs come to my state……. but according to the union (and apparently the federal government as well), those jobs must remain under union control. Dictatorial? I think that a trade is primitive and savage when there is no profit for all parts implicated in a deal. But then again, if everybody profits then there is no profit, for it looks like equally spreading of wealth. A corporation should naturally pay taxes for the country where it resides, if not, then it looks exactly like a dictator of the third world who takes all the money from the deal with said corporations and give nothing the workers implicated in trading. Priscilla, I understand your point of view. It is in the human nature to seek higher levels of success to get above others. I am not bitter, reactionary, radical or fundamentalist kind of guy against the “successful” ones, I just dislike extremities thus I am a moderate. I read the article you posted. I still would like to say that my ancestors came in 1749 to America. They were outcasts in the Colonies as they were Roman Catholic in an Anglican land. They learned their “English”, worked with “English”, and the descendants were grateful more for this because it showed a strong commitment to a believe that this land (idea of freedom) was not only worth fighting for but a great cause for peace between what could be war between many different people with many different languages and customs. I see today that this “left-wing idea” that all Americans are more “Free” if they come to America and stay the same. In some way…”Diversity”. It is one thing to celebrate our old Customs, but we are making a whole new custom once we arrive in America and it should be as it is called the “Great Experimentation”. When emigrants keep what they know and don’t “assimulate” they keep their ideas, customs, way of life to themselves. They isolate. Thus, not sharing. You can find many nations like this and if this keeps up then the “Great Experimentation” is over. Other nations have issues with keeping a “balance” between groups of people because of the “isolation stance” or in other words “voluntary segregation” that the left-wing is pushing. From what I have noticed from observation. Black people went from forced segregation to busing (assimilation), then to non-busing. All leading to “voluntary segregation”. In some way the profiting white person is trying to control the minority….at least that is what the white Socialist is saying in Politics. And the thing is…the one saying it wants it that way for power. It is true and basic of nature to accept that cultures of the same prefer the same for comfort and if this does continue some areas of the country or even towns will be off limits to other cultures when a dispute (Watts riot) occurs. There is a bigger power grab for control of the populace than most realize. By using fear along culture lines you can manipulate the political system for your own greed. How do you think that most are career politicians and most people who don’t pay attention to their congress person says that it isn’t their own representative….it’s someone else who wants to take away my minority welfare. It’s all smoke and mirrors for power and control over the populace and a better way to do it is to divide and conquer thru “Diversity”. Like stated, I am for Assimilation with due respect to one’s past culture. I like speaking to others different from myself. It is enlightening, but most I meet in public because they keep to themselves in the inner-city because of this “manipulation of the masses” over time and I would say that welfare and other government programs have a big part in keeping certain cultures so “comfortable’ that they don’t grow wealthy and expand their knowledge of the great opportunities this country has to share and offer with others different than themselves. Priscilla wrote: …seriously, what country GIVES BACK land that they have won in war ?